Our friend Jens is the gynecologist at Diospi Suyana. Jens is a man of action, full of energy and faith. I have been impressed by many things about him: his work ethic, his generosity in time and friendship toward others, his joy in the Lord, and his medical knowledge. It is a blessing to have him as a part of the hospital and as our friend. 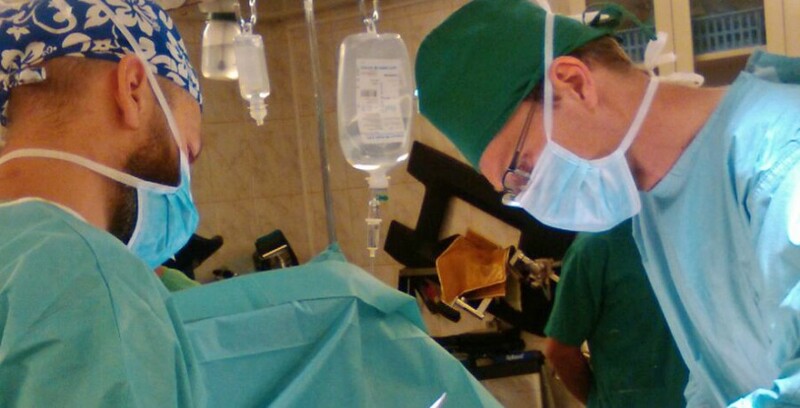 Here is an article from the Diospi Suyana Hospital website about a recent patient of his. The indigenous woman lives in the rain forest in the state of Puno. Her abdomen is getting bigger and looks like she is in the late stages of pregnancy. But in her uterus nothing moves. Instinctively Ernestina* feels she is in a very serious situation. She hears about the Diospi Suyana hospital in the state of Apurimac. She has heard all the patients there, including the Quechuas, are treated with respect. Should she take the long journey in her condition? The trip to Curahuasi takes 15 hours. Her confidence increases. If what others say is true about Diospi Suyana, they can help. Gynecologist Dr. Jens Hassfeld interviews the patient. Then follows with a conscientious physical examination. His suspicion is soon confirmed by an ultrasound. The indigenous woman is suffering from a large tumor in her abdomen, most likely emanating from the ovaries. All signs point to a malignant tumor. Dr. Susen Dressler leads the anesthesia. The monitor displays the regular heartbeats of the patient, while Dr. Hassfeld – assisted by OTA Simon Giesbrecht – hopes to offer the women perspective that extends beyond a few months. God is the Lord of life and death. That is the belief of the gynecologist from Baden, Wurttemberg and therefore he has placed the sick woman, nurses, and the whole surgical team in the custody of the Most High. Three long hours elapse. Both ovaries are fused together by the malignant tumor. The dissection is not easy, but eventually they finish. As a missionary doctor, Dr. Hassfeld earns nothing for this intervention. His pay is the knowledge of having done the right thing. And if chemotherapy does well, the mother can accompany her two children for many years. This entry was posted in Curahuasi, Diospi Suyana Hospital, Medicine, Missions, Peru, Quechua by cairesonmission. Bookmark the permalink.